Now that you have that large screen and projector installed, you will need to consider professional speaker installation for a large sound to match that large picture. We offer a few options, depending on room location in the home and flooring surface. A few of the options we offer are satellite or bookshelf speakers with wall mounts, ceiling speakers, and in wall speakers. 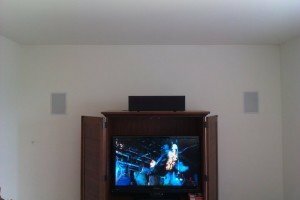 Bookshelf and satellite speakers can be modified and installed almost anywhere. We can mount them on the wall using speaker mounts or using the supplied mounting brackets. Bookshelf speakers can be easily installed flat on most surfaces like a fireplace mantle without the need for hanging hardware or speaker mounts. 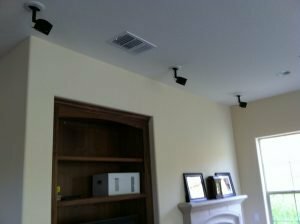 Ceiling speakers are the favorite of most new homeowners because they provide great sound while blending into the ceiling without causing an eyesore. 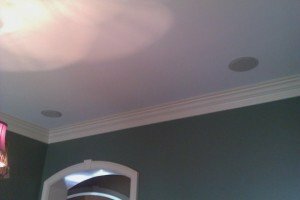 Our ceiling speakers are round in shape like can lights and come in standard white color but can be easily painted to match any color. If your home is not prewired for ceiling speakers, we may be able to run the wires for you. We require a pull down door to enter the attic and a large enough attic space to work comfortably. Some attics have obstacles and tight spaces that prohibit us from safely moving around without the risk of falling through the drywall. If your attic is spacious enough, we can run 16 gauge speaker wire and install a complete 5.1 or 7.1 surround sound system for your home theater room. Our in wall speakers are rectangular shaped as opposed to round like ceiling speakers to better match your home’s interior lines. 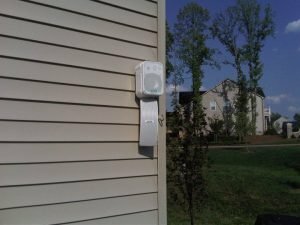 If your room is not pre wired for in wall speaker installation, speaker wire can be ran under vinyl siding, under carpet, through basements, and attics in one story homes with pull down ladders. We do not run speaker wire through crawlspaces unless it tall enough to stand up. Our in wall speakers come in standard white but can easily be painted to match any color. We can provide both ceiling and in wall speakers or will gladly install your new or used speakers. You will need to provide a receiver and subwoofer to install a complete 5.1 or 7.1 surround sound system. 5.1 Or 7.1 Surround Sound? 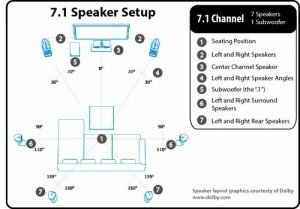 What is the difference between 5.1 and 7.1 surround sound? A 5.1 surround sound speaker package consists of 5 speakers – front left, front right, center, rear left, rear right – and a sub woofer. 7.1 adds 2 more channels for surround sound to further enhance your listening experience. 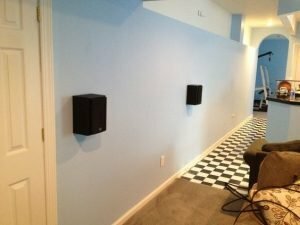 Some homeowners even prefer a 7.2 speaker setup which includes a pair of sub woofers for extra deep low end frequencies. Whether you enjoy an occasional dip in the pool or cooking on the grill with family and friends, outdoor speakers will bring life to your outdoor patio and backyard. 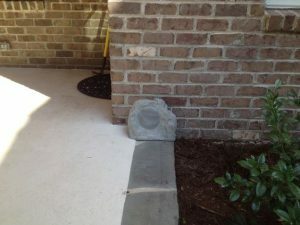 Most outdoor speaker setups consists of only 2 speaker for left and right stereo sound. Some of our customers have even gone to the extent of having sub woofers installed outdoors for extra bass. Huge rectangle shape speakers have evolved to to small rock speakers, frogs, gnomes, and odd shaped sub woofers with spikes that stick into the ground. You can find some amazing deals on outdoor rock speakers on Amazon here. Amazon currently carries the popular 8″ Outdoor Weather-Resistant Omni-directional In-Ground Speaker for only $76.88 plus free shipping. 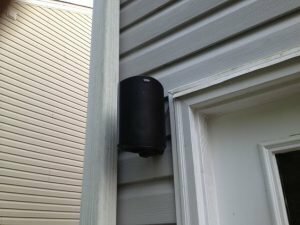 Our expert team has perfected various methods of running speaker wire for outdoor speakers including using vinyl siding, ground trenching and using natural landscaping materials. 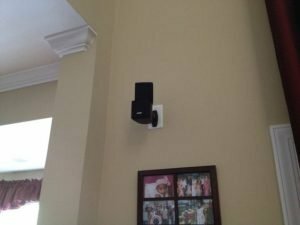 Browse our gallery for more ideas and information on your next speaker installation project.